An article published in Cell by a research team from Oslo and Zürich reveals a new aspect of chromosome biology: To spread or not to spread? Although the mechanisms that mediate chromosome condensation have been extensively studied for decades, little is known about the molecular mechanisms that initiate and control chromosome condensation at mitosis entry. Furthermore, how cells discriminate between normal chromosomes and potentially harmful non-chromosomal DNA during mitosis remains mysterious. 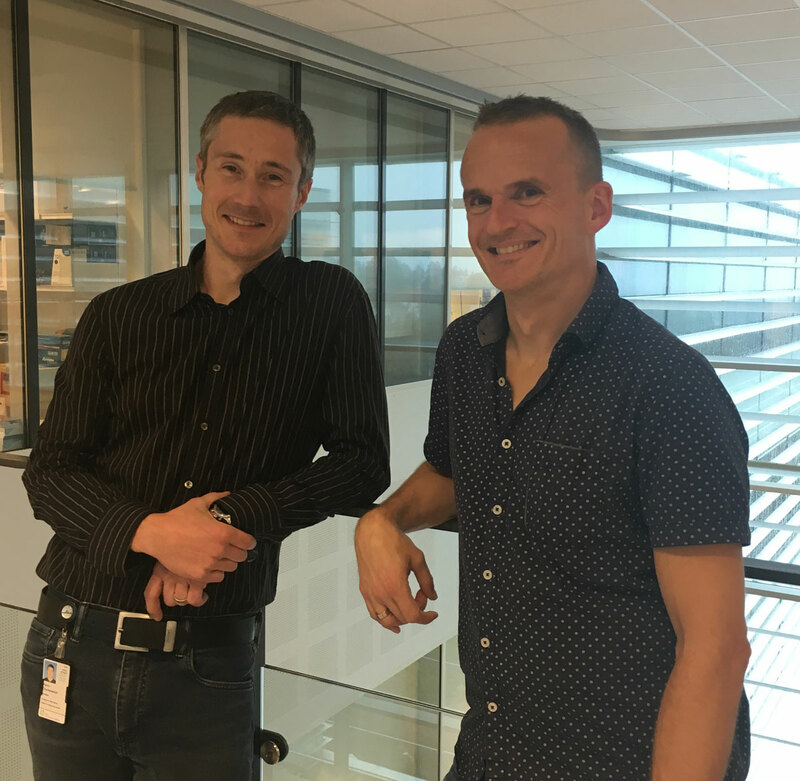 A collaborative work by the groups of Jorrit M. Enserink (OuH), Pierre Chymkowitch (OuH) and Yves Barral (ETH, Zurich, Switzerland) suggesting that centromeres play a so-far under-explored role in chromosome condensation and immunity mechanisms is published in Cell and now available online. This is the fundamental question that a research team from Oslo and Zürich answered by uncovering a yet unknown mechanism that shapes chromosomes during cell division. Cell division, or mitosis, is the moment of the cell cycle when duplicated chromosomes are symmetrically segregated between the mother and the daughter cells to ensure the transmission of the genetic information to the next generation. Such symmetrical segregation requires that chromosomes reorganize their shape from voluminous and fluffy to compact and rigid, giving rise to the iconic X shape of mitotic chromosomes. This mechanism is known as chromosome condensation. In addition, during mitosis, the mother cell can retain non-chromosomal DNA species (such as viruses or transposons) to prevent their transmission to the daughter cell. This process, which is often referred to as asymmetric segregation, protects the daughter cell from the potentially deleterious effects of these harmful entities. 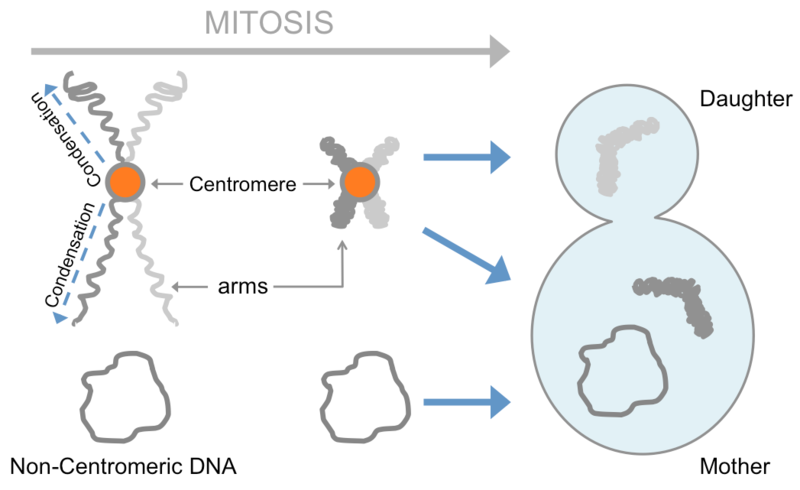 This study shows that in yeast cells mitotic condensation is initiated (“licensed”) by the centromere of each chromosome, and spreads along chromosome arms in a chromosome-autonomous manner. This also provides the cell with a mechanism for symmetric segregation of chromosomes at the end of mitosis, since non-centromeric chromosomes or non-chromosomal DNA molecules do not condense and remain confined to the mother cell upon cell division. These exciting findings suggest “that centromeres play a so-far under-explored role in immunity mechanisms, protecting the cell and its progeny from the propagation and interference of infectious genetic material”. This collaborative work by the groups of Jorrit M. Enserink (OuH), Pierre Chymkowitch (OUH) and Yves Barral (ETH, Zurich, Switzerland) is published in Cell and now available online. So if you want to know more details about the molecular mechanism by which centromeres license chromosome condensation, click on the link to the reference below.